On May 16, 1903 at 8.05 pm, more than 250,000 electric lights illuminated the Brooklyn sky when Skip Dundy and Fred Thompson opened Luna Park at Coney Island. it was one of the three original large parks built on Coney Island, the other two being Steeplechase Park and Dreamland. 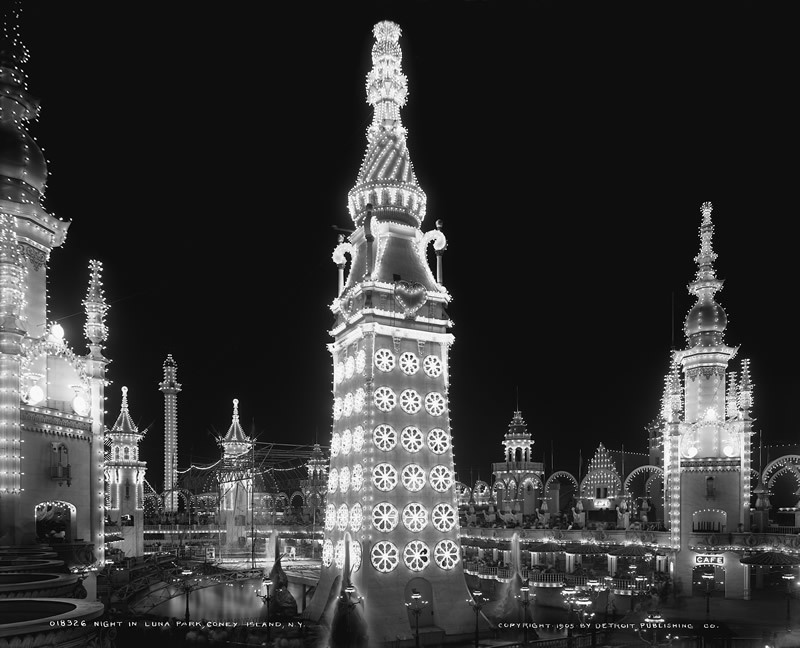 At the center of Luna Park was the 200-foot tall Electric Tower that was decorated with twenty thousand incandescent lamps, a smaller version of the Electric Tower from the Pan-American Exposition two years earlier. Set against the theatrical backdrop of Coney Island at the turn of the 20th century, “Luna Park” depicts the birth of the most iconic—and controversial—amusement park in the world. Join APAC (Astoria Performing Arts Center) on Saturday December 1st at 8 pm and Sunday December 2nd at 3 pm for a Benefit Concert of this luminous new musical by Hyeyoung Kim (Jonathan Larson Award Winner), Michael Cooper (Outer Critics Circle Nominee for It Shoulda Been You on Broadway, Jonathan Larson Award Winner), and Daniel F. Levin (Richard Rodgers Award Winner). APAC Artistic Director and NYIT Award Nominee Dev Bondarin will direct. Both performances of Luna Park will take place at the new RIOULT Dance Center and will be followed by a Coney Island-themed post-show celebration for select ticket buyers. All proceeds will directly benefit Astoria Performing Arts Center. And make a New Year’s resolution not to miss APAC’s 2019 season which starts with the New York premier of “Queen,” by Madhuri Shekar, directed by J. Mehr Kaur, running from January 31 to February 16, 2019, on Thursdays and Fridays at 8pm, Saturdays at 2pm and 8pm. The Black Box at the Variety Boys & Girls Club of Queens, 21-12 30th Rd @ 21st St, Entrance on 21st St.